The Problem of Asia, the celebrated American naval historian and strategist, Alfred Thayer Mahan, analyzes the geopolitical structure of world politics at the dawn of the twentieth century. Mahan wrote his book at a time when the United States was emerging as a world power, having recently acquired overseas territories as a result of its victory in the Spanish-American War. It was a call to America and its leaders to break with the intellectual tradition of Washington's Farewell Address and to recognize that U.S. security was tied to the balance of power in Asia as well as Europe. 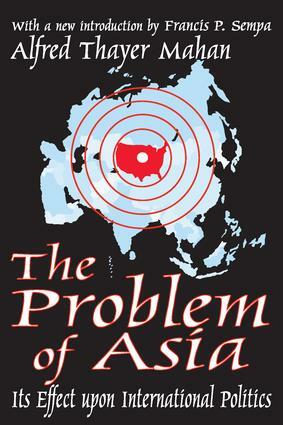 For Mahan, the immediate "problem of Asia" was the threat of Russian expansion into Central Europe, Central Asia, East Asia,,and the Middle-East/Persian Gulf region. Mahan advocated an alliance consisting of Britain,. Japan, Germany, and the United States to counter the Russian threat. He also discussed the rise of Japan as a world power, the potential for China to emerge as a great power later in the twentieth century, and the increasing importance of the Middle East/Persian Gulf region to the global balance of power. The Problem of Asia contains geopolitical insights and analyses that remain relevant today. As recent events have reminded us, the world of the twenty-first century is still composed of nation-states and non-state actors that vigorously and sometimes brutally pursue their goals and self-interests. Mahan's approach in The Problem of Asia to the study and analysis of international politics in an anarchic world provides an important conceptual framework for understanding the fundamentals of global politics. This edition of Mahan's classic work includes a lengthy introduction by Francis P. Sempa that analyzes the book in the context of Mahan's life and other writings.